Two ceremonies were held today to swear-in new Supreme Court Justice Neil Gorsuch. The first private ceremony was conducted in the Justices' Conference Room by Chief Justice John Roberts. 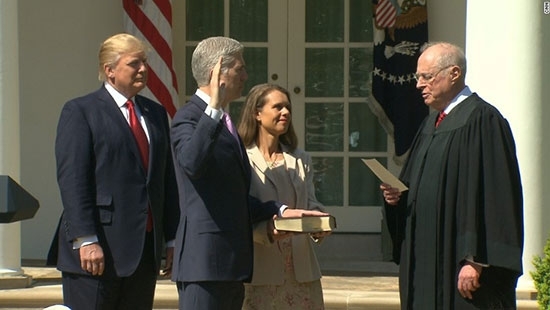 Gorsuch was sworn in again in a public ceremony at the White House Rose Garden by Justice Anthony Kennedy for whom he once served as a law clerk. The 49-year-old former appeals court judge from Colorado promised to be a "faithful servant of the Constitution and laws of this great nation." He fills the seat left vacant in February 2016 following the unexpected death of the late Justice Antonin Scalia. The Jay-Z curated Made in America Festival will return to Philadelphia for the sixth year. The announcement was made today on the festival's website. The music fest will once again take over the Benjamin Franklin Parkway near the Art Museum on Labor Day Weekend. This year, that falls on Saturday, September 2nd, and Sunday, September 3rd. No acts have been announced. No word on when tickets may go on sale. Police are looking for a man who was caught on surveillance video assaulting a maintenance supervisor at an apartment complex in West Deptford Friday morning. It happened around 8:45 a.m. at the Westwood Court Apartments on Tatum Street. Police say the suspect was throwing sticks at a window. When the maintenance man asked the suspect to leave he began to argue. The suspect started to film with his cell phone and put the phone right in the man's face. He then struck the man in the face with the phone. The maintenance man fell to the ground and suffered lacerations to his face. The suspect fled in a silver car with unknown temporary registration. Anyone who recognizes the suspect is asked to contact West Deptford Police at 856-845-2300. Watch the video below. The Philadelphia Eagles have signed former Penn State quarterback Matt McGloin to a one-year contract. McGloin went undrafted in 2013 and was picked up by the Oakland Raiders. The 27-year-old spent the last four seasons with the Raiders starting 7 games and appearing in 13. He has 11 touchdowns and 11 interceptions. This afternoon, Sunny, temperatures in the upper 70's in Center City.